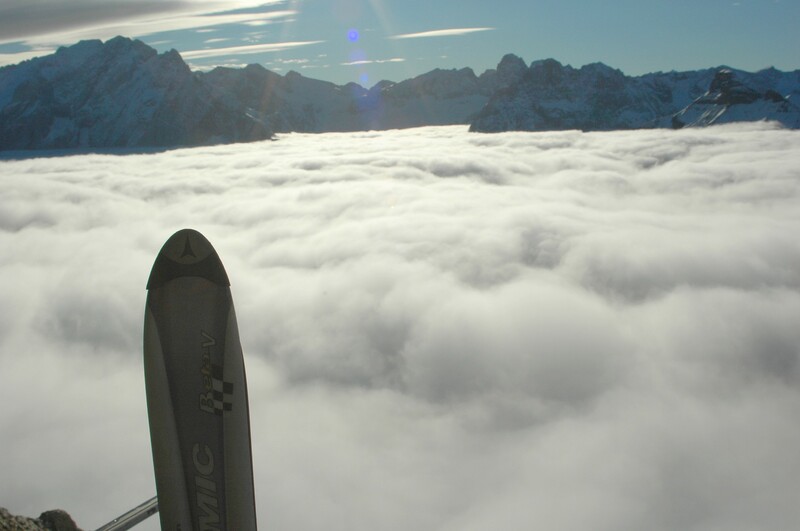 Scouting around for new European ski destinations? 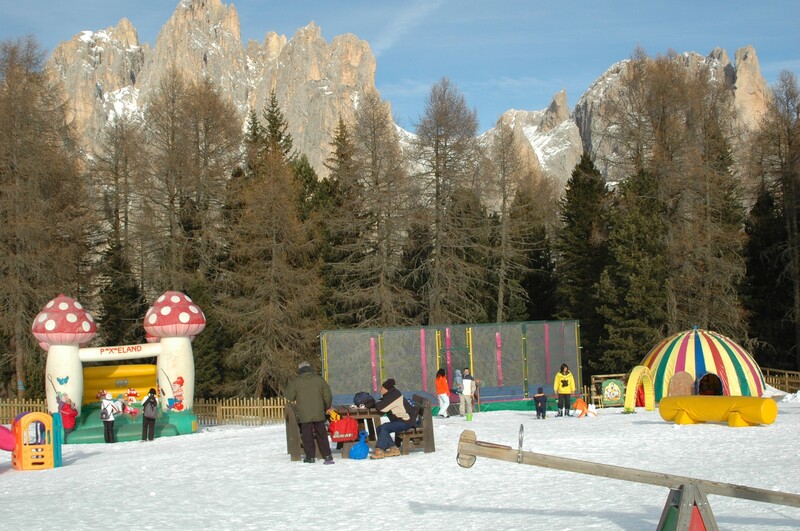 The ski areas of Italy’s Val di Fassa are great for everyone, but particularly for families. 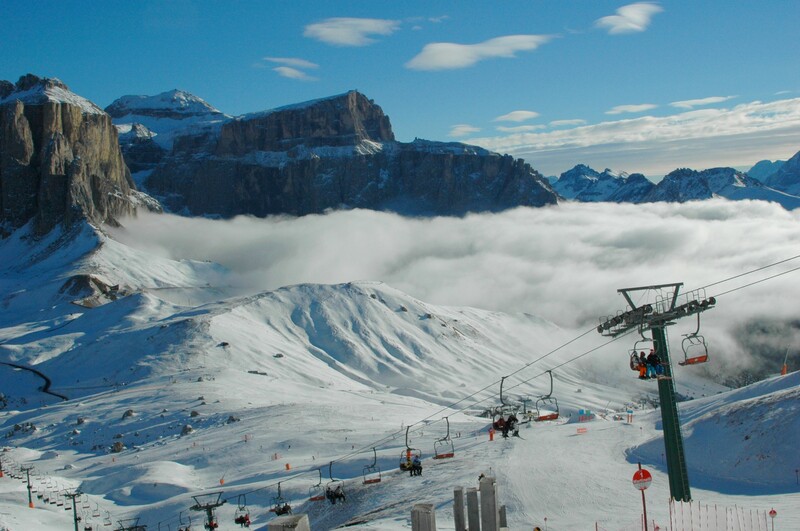 Val di Fassa is part of the massive Dolomiti Superski complex, with 12 different ski areas making a combined 1,200 kilometers of pistes. 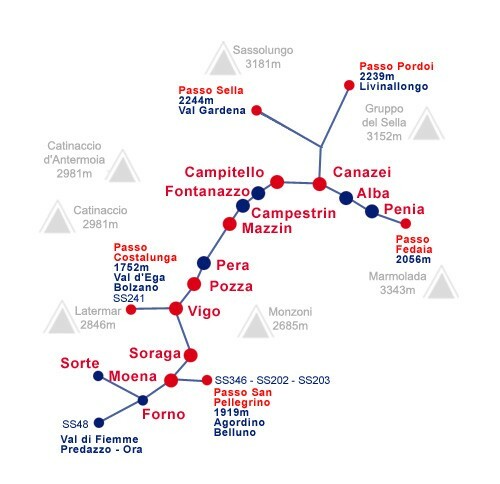 Chances are, though, that you’ll be sticking to the main areas of the valley itself in the 17 km (10 1/2 mile) stretch between Moena and Canazei, which still encompasses the five areas of Canazei, Campitello di Fassa, Pozza di Fassa, Vigo di Fassa, and Moena – quite a lot of terrain indeed. 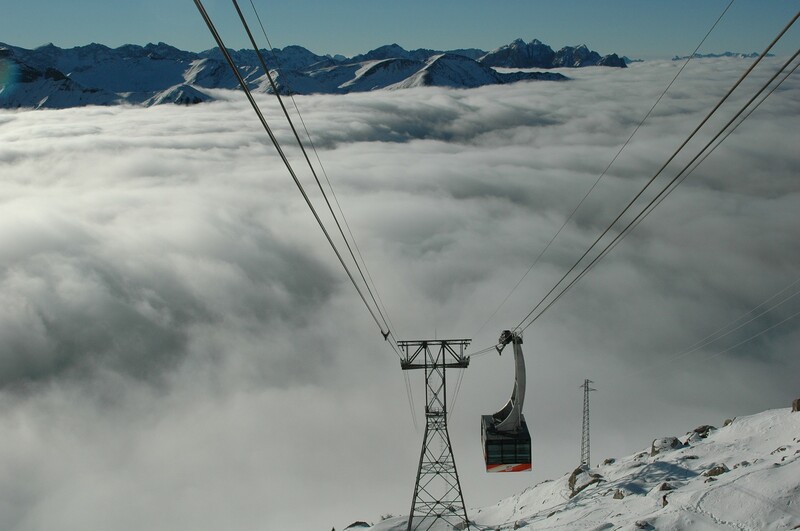 The area has what must be some of the most spectacular scenery of any ski destination in Europe, and it’s a breathtaking experience to have your gondola pierce through the early morning cloud cover to see the jagged dragon’s teeth of the Dolomites jutting above a rumpled sea of white. The villages in the valley are picturesque as well, and the food is, of course (this is Italy, after all), excellent. 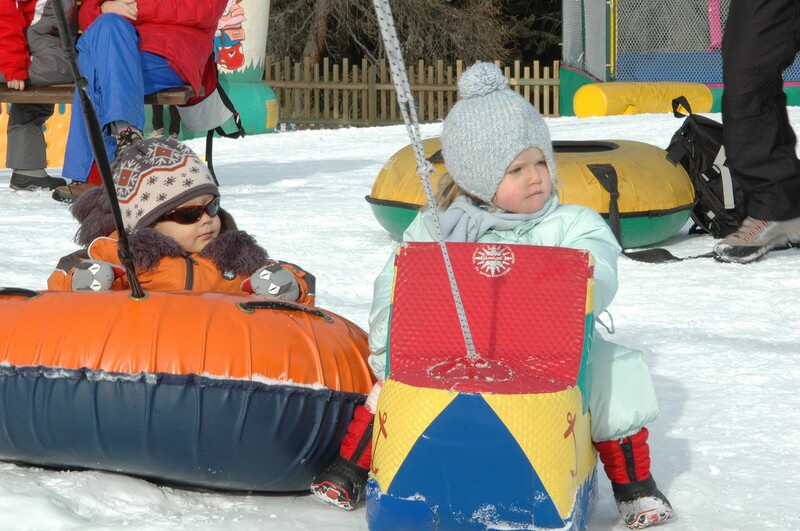 There are several fantastic snow parks for kids, both on the slopes and in the valley. 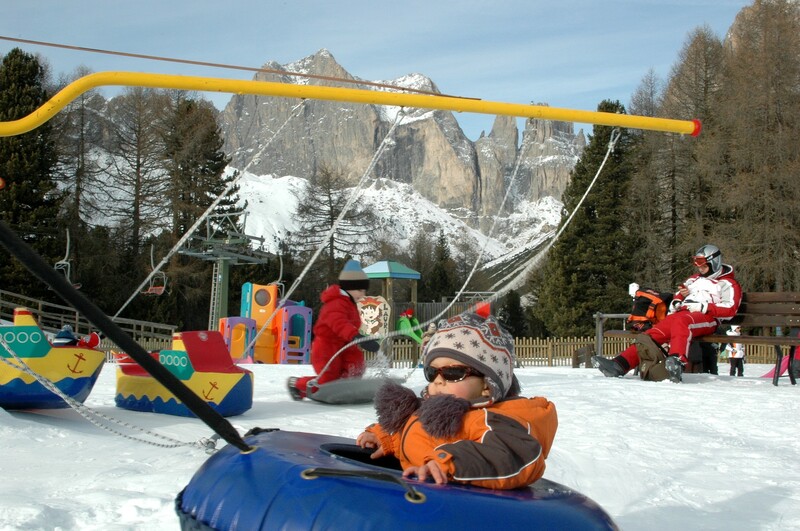 Canazei and Vigo di Fassa both have high-altitude children’s fun parks, and Moena has two, while Canazei, Campitello, Pera di Fassa and Moena have well-equipped parks with sledding, skiing, tubing and the like on the valley floor. 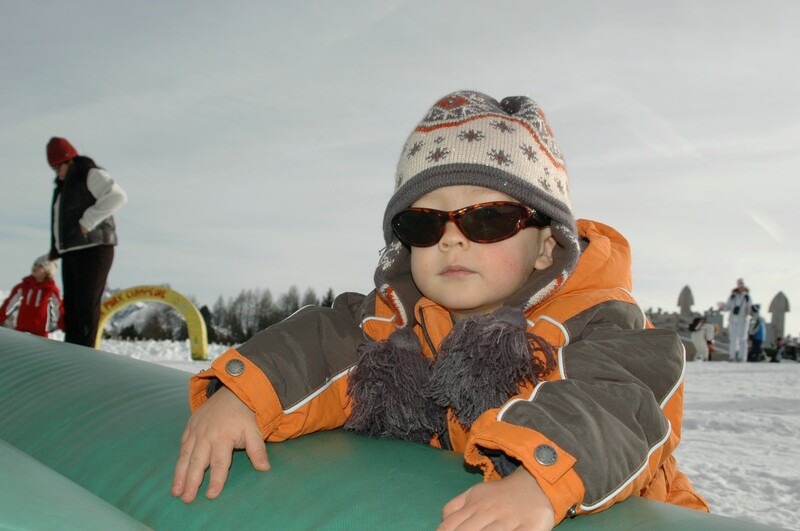 There are also babysitting nurseries for the very young (3 months to 3 years) in Canazei and Pozza di Fassa. All of them offer ski lessons, but even if the little ones don’t want to ski it’s fun to take the gondola up the mountain just to hit the fun parks, and when you’ve have enough of the cold you can grab lunch and an amazing view at one of the great mountainside restaurants. 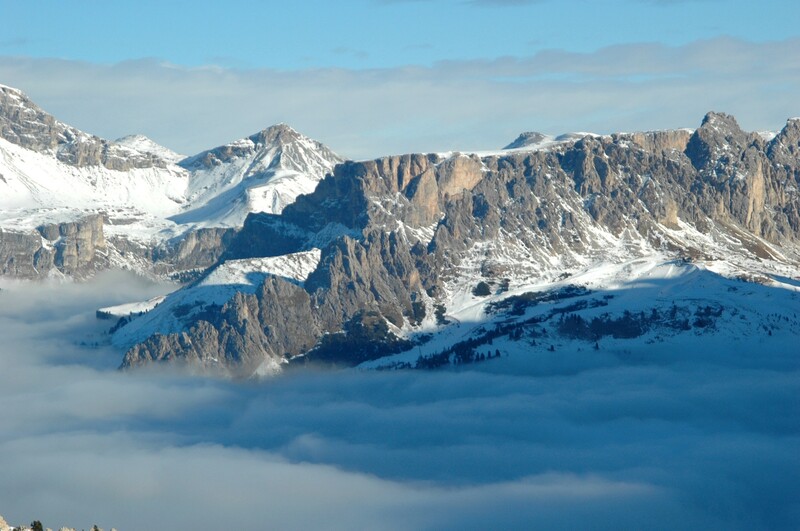 For really advanced skiers looking for a challenge, Val di Fassa isn’t perhaps the best choice, with only 11 kilometers of black runs as opposed to 84 km of red and 27 km of beginner slopes. If you’re with kids, though, that probably isn’t much of an issue, and for older kids, who probably snowboard, there are several snow parks where there are things like parabolic curves, boxes, and rails, which sound like a lot of geometry and railroad terms to someone like me, who tried snowboarding for one day, by the end of which I felt like I had been put in a sack with a bag of rocks and placed in a tumble dryer. A painfully hyper-extended thumb, bruised coccyx and cracked rib were my rewards for an aggressive day of boarding. I’ll stick to the sticks, thanks very much. But if the tweens and teens are interested in a bigairbag, boardercross, box, jibbing area, kicker, and slopestyle lines, well, they’ve got ’em. Whatever they hell they are. (Actually, the BigAirBag is a huge (17 x 11 meter) air-mattress “able to cushion any jump and where riders can train their air-evolutions, have fun, challenge themselves and improve their style, knowing they can count on a soft landing.” Which sounds pretty cool.) You can check out a video of the park at Canazei, which interestingly doesn’t actually show much of the park, but has gorgeous footage of the surrounding scenery. 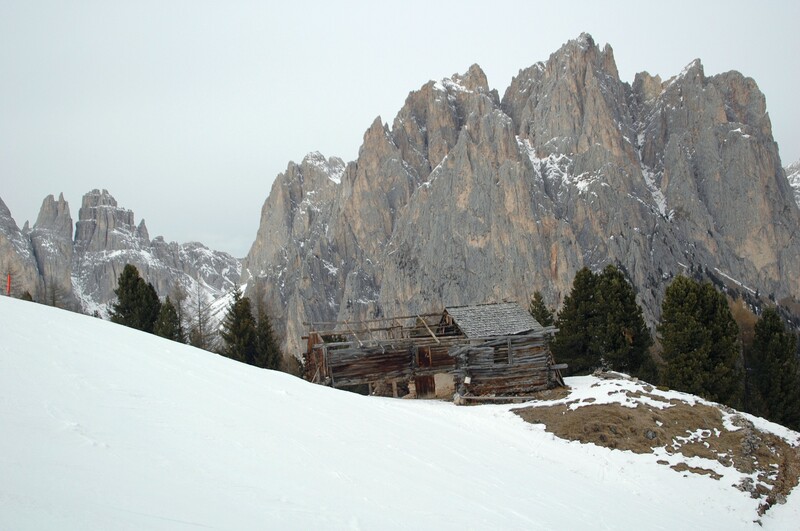 With seven villages in the valley there is abundant accommodation, and the official Val di Fassa website is a good place to start your search. Visitfassa.com has extensive listings, and as always Booking.com has a good selection. As the valley is fairly compact, any of the villages can make a good base for a ski holiday. Since there is only one road through the valley, once the lifts close and people head out in search of restaurants and nightlife it can get fairly congested, so you need to keep that in mind when setting off for the evening. We stayed at the Hotel Crepei in Pera di Fassa, and were pleased beyond belief. There’s an indoor pool and spa center, a special children’s room with games and toys, and a a game center with table tennis, table football and a pool table. But it was the food that bowled us over. You had us at the food. We opted for half board (breakfast and dinner), and were over the moon about the breakfast buffet and the three-course dinners, which included access to a salad buffet that would have been a meal unto itself. Now, I’m a former chef and our standards are pretty high, but the Hotel Crepei met or exceeded our expectations at every meal. We were there for Christmas, and after we put our son down for the night we had a candlelit six-course Christmas meal that could rival anything you would expect at at the most exclusive fine-dining establishment. The menu (which we kept) was: fillet of chicken wrapped in bacon with baby greens in balsamic, homemade finger noodles with shrimp and zucchini, thyme-perfumed gnocchi with pancetta and mascarpone sauce, turkey in nut and mustard crust on a bed of sauteed spinach, venison chop with pear and cranberry sauce on polenta, and a selection of desserts. This, amazingly, was included in the standard cost of our stay. We brought our own special bottle of wine and stumbled back to our room satiated and smiling. Now that we have two kids we may have graduated from family hotel rooms and would scout around for self-catering flats (see our previous post about holiday rentals for thoughts on that), but there is a definite advantage to returning to a hotel after a full day of skiing or even sledding or hiking and not having to prepare a meal. It’s a trade-off, to be sure, but when you’re spent after a day on the slopes sometimes the last thing you want to do is either bust out the cookware or pack the kids up again to go out to a restaurant. Since we had half board at the Hotel Crepei we didn’t eat out much, but one place that had us coming back for more was Il Vecchio Mulino (the Old Mill) in Pozza di Fassa. Great food and friendly service in a lovely old wood-and-stone watermill. Try the fig and cinnamon ravioli if they have them. Marvelous. Very highly recommended. 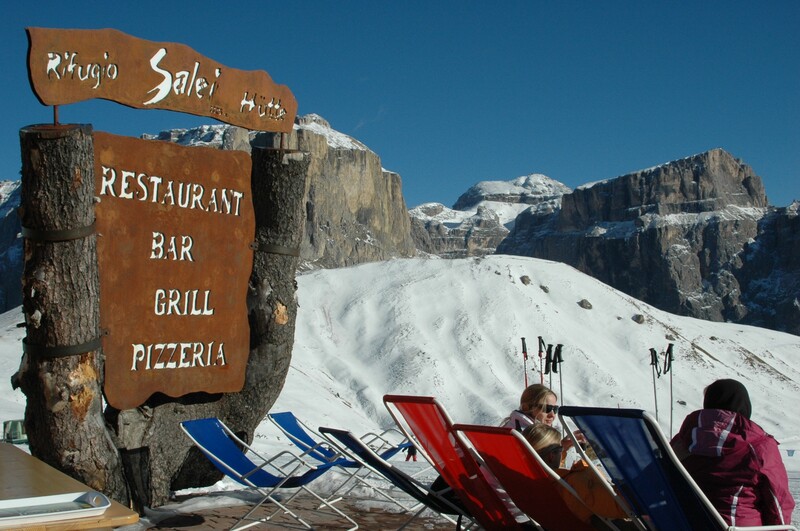 For a family ski holiday that’s a little different, definitely look into the Val di Fassa. Stunning scenery, amazing food, and great skiing make it a phenomenal destination, but what really makes it stand out is how dialled in they have it for kids. This sounds fantastic. As you say, you had me at the “jagged dragon’s teeth of the Dolomites jutting above a rumpled sea of white” then the food clinched it. This is a must-visit. It’s a wonderful area, Cuttlefish. I’d actually like to go back in the summer to do some hiking. 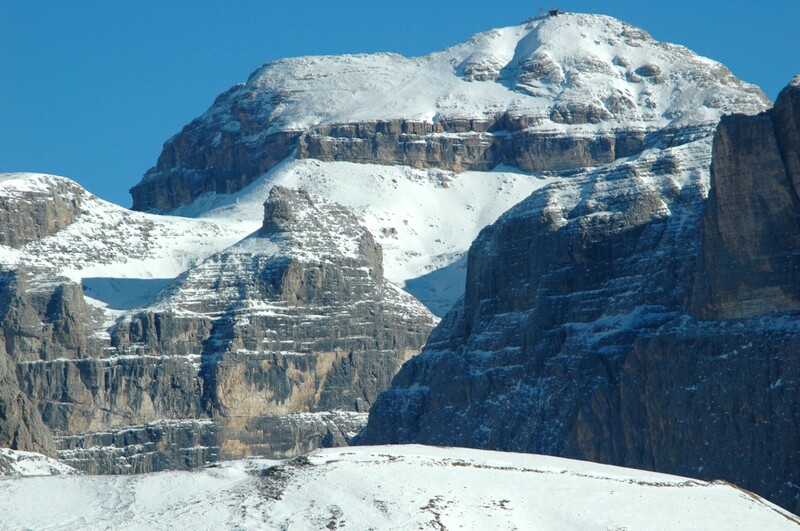 The Dolomites are truly spectacular.